This Copa del Rey tie against 3rd-tier side Olimpic Xativa has been far from being a walk in the park for the Merengues, despite what many had initially previewed. Real Madrid managed to pull off a crucial 2-0 win on last night's 2nd leg hosted at the Santiago Bernabéu, thanks to goals from Asier Illarramendi and Angel Di María. 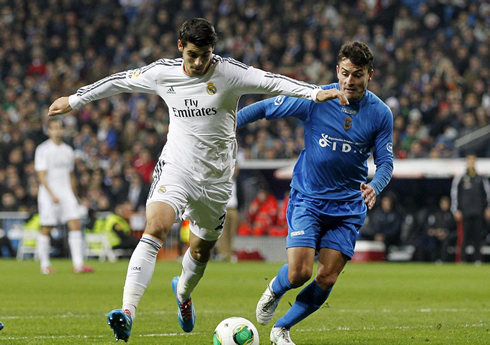 Real Madrid will now face Osasuna next January, in the competition's last-16 stage. Maybe calling Real Madrid team from last night a "Canteranos side" might be a bit of an overstatement, since in reality the home side only lined-up with 6 players that have gone through the club's youth categories. Nevertheless, it's more than half of an 11-man team and it hasn't been usual to see such a phenomenon taking place in Madrid over the last years. The Merengues defeated Olimpic Xativa by 2-0 and assured their passage into the last-16 stage of the Copa del Rey, after coming out of the first leg with a goalless draw. Cristiano Ronaldo served his last game of suspension in the competition and he'll be completely fit and ready to help the team by next Sunday, when Real Madrid vists Valencia for La Liga's last fixture of the 2013 calendar year. A lot of people will struggle to even guess the stadium name from this Wednesday's visitors at the Santiago Bernabéu. Despite their anonymity in the big stages, Xativa was not an easy nut to crack. Not only Real Madrid couldn't count with Cristiano Ronaldo, but also Gareth Bale ended up being sidelined for this mid-week cup game against Olimpic Xativa due to a small injury. Carlo Ancelotti picked out a very young starting eleven, in line with what he had already done on that first leg goalless draw on December 7. This time things were slightly different though, as the Merengues definitely felt more comfortable at playing on their own home ground and cruised past Olimpic Xativa with an easy 2-0 win (2-0 on aggregate too), which allows them to go through to the next round of the Copa del Rey, where they'll be facing Osasuna. After a full 90-minute game where both sides failed to score a single goal, it took no more than 16 minutes for Real Madrid to finally open the hostilities and get in front of this tie. Angel Di María picked a short pass from Illarramendi already inside the visitors' half and sent a lob pass towards Jesé a few meters ahead, who had just escaped his marking. The Canterano kept his composure after his first touch to receive the pass and then left the ball over to Illarramendi, after having spotted him making a run from behind to support the attack. The former Real Sociedad midfielder showed he also has more than just defensive skills to bring up to this team and finished it off with a nice right-foot strike. 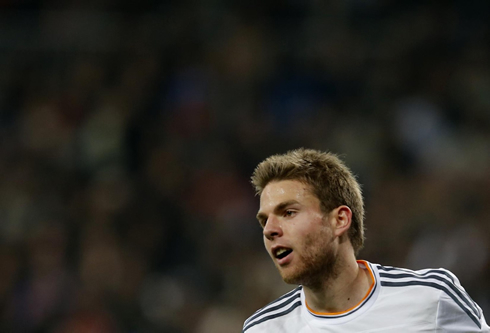 It was Illarramendi's first goal ever for Real Madrid. Angel Di María would get again involved in the play that led to the 2nd goal around the 27th minute, after crossing the ball into the visitors' box and seeing Alvaro Morata's header being blocked by a Xativa defender's arm. The referee didn't hesitate much and pointed to the spot, granting Di María his first opportunity to score from the penalty-mark as a Real Madrid player. The former Benfica winger didn't waste his chance and set the score in 2-0, allowing the home side to face the rest of the game in a lot more relaxed way. That was probably the reason why the game ended up becoming a bit boring from that moment onwards, since Real Madrid's men on the pitch felt they had already done enough to guarantee the passage to the next round and Olimpic Xativa wasn't strong enough to create any serious problems to Iker Casillas. The Real Madrid goalkeeper had another very calm night at the back, completing another clean sheet game for his team. Even though Real Madrid played with many of their reserve players, they couldn't help but to leave the idea that they should have done in last night's game. Whether it was the Merengues first or second team playing, they had the obligation (at least to the fans) of presenting them with a better attacking game and show than they did. By going through to the next round, Real Madrid will now take Osasuna on another 2-leg tie, since "Los Rojilos" also earned an aggregate victory over Malaga. They tied at 3 goals on their first away game and then pulled off another draw last night, this time with only 1 goal scored to each side. The away goals rule allowed them to get the better off Malaga, but they'll now have to lock horns with Real Madrid during the first weeks of 2014 and Ancelotti already stated that he won't be rotating his side as he did anymore. Since Cristiano Ronaldo has finally completed serving his 2-game ban in the Copa del Rey, he'll be eligibile to play against Osasuna on both legs scheduled for January. Attackers: Angel Di María, Jesé, Alvaro Morata. Cristiano Ronaldo next game will be for Real Madrid, against Valencia for La Liga, this next Sunday (December 22, 2013). You can watch Juventus live stream, Valencia vs Real Madrid, Getafe vs Barcelona, Manchester United vs West Ham and Fulham vs Manchester City, all matches provided from our live football streaming section.